As one of the most experienced and capable Incident Management Teams (IMT) in the world, the EMSI IMT is a highly qualified and experienced Type 1 IMT available to support government and private sector entities on a worldwide basis. With highly skilled incident management professionals, team members are drawn from a diverse range of disciplines and average over twenty years of Type 1 all-hazards incident management experience. 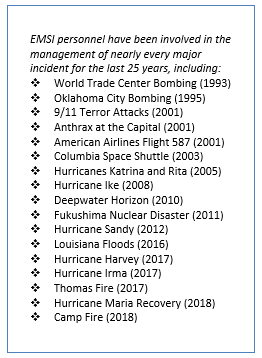 Collectively our team members bring hundreds of years of response experience using ICS on thousands of all-hazards incidents of various complexity levels. The depth of the EMSI IMT affords us the ability to support simultaneous IMT deployments without degrading the capability, experience, or quality of the team. Team members can assume primary position responsibilities or can function as Deputies and Assistants. Additionally, they can serve as coaches or advisors to incident management personnel filling ICS positions. 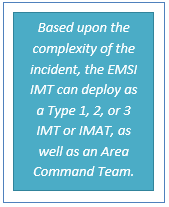 With a deep bench of qualified team members, the full EMSI IMT can be brought to bear on an incident, rapidly standing up the IMT and immediately taking charge of response efforts. Use of the full IMT may allow organizations to continue to focus on day-to-day operations instead of pulling personnel off their normal jobs to respond. Flexible by design, the EMSI IMT can be used to augment an existing IMT by plugging shortfalls in IMT functional staffing, bolstering specific areas with additional expertise, and serving in Deputy and Assistant positions. Looking for a qualified and experienced Area Command Team? The EMSI IMT includes Area Command qualified personnel and can be configured for Area Command assignments. The Planning Section is a critical component of any ICS organization. One of the most difficult functional areas of the ICS organization to maintain proficiency, the Planning Section includes functions not typically performed in normal day-to-day business operations. Tasks such as operational resource management, situational awareness, and incident action planning lack the frequent practice and familiarity necessary to build confidence and competence. A solution to this challenge is to utilize the EMSI IMT as a “Turn-Key Planning Section”, leveraging the qualified and experienced EMSI Planning Section personnel to fill the critical Planning Section functions. The EMSI IMT can function in a mentor capacity for IMTs looking to work with an experienced Type 1 IMT. Under this arrangement, the EMSI IMT can fill the primary ICS positions with another IMT serving as Deputies and Assistants. This allows the EMSI IMT to mentor less experienced IMT personnel providing not only an opportunity to complete ICS position task books, but an invaluable learning experience. With a broad range of incident management experience, the EMSI IMT can be utilized at the incident level and in an EOC/CMT to assist in the overall coordination of the incident. 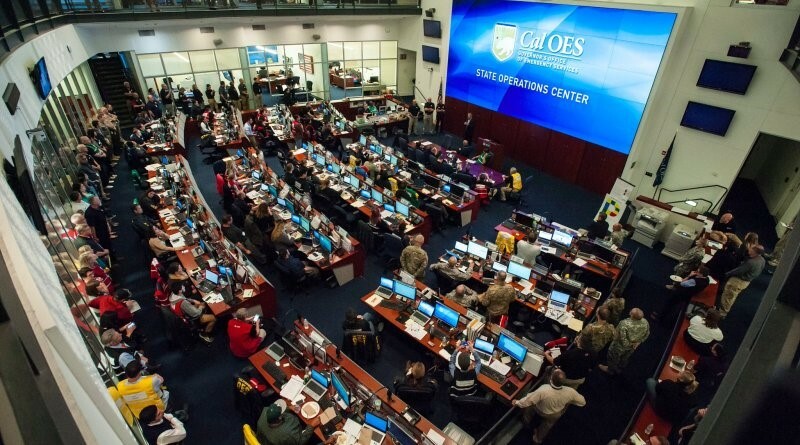 Our team has experience operating at every level of an EOC and can help your organization organize to respond to any incident. Managing the information flow to stakeholders during an incident can be overwhelming and detrimental to the success of the response when the public doesn’t understand what is being done to mitigate the crisis. The establishment of a Joint Information Center, guided by an EMSI team, can help alleviate that information gap and ensure that the Incident/Unified Command’s message is heard. EMSI is a global leader in the application of the ICS for all-risk, all-hazards, multi-discipline incidents and is proud to have assembled one of the most seasoned teams of incident management and response experts in the world. With industry-leading experience and qualifications, the EMSI IMT works to understand the unique challenges of each incident and response environment to adeptly apply incident management solutions rooted in common incident management and ICS doctrine. As one of the most accomplished and well-rounded teams of incident response and emergency management experts in the world, the EMSI IMT draws its strengths and core capabilities from the experience and knowledge of our team members. The IMT consists of proven incident leaders, dedicated to the field of emergency management, with diverse professional experience and qualifications at the highest levels. 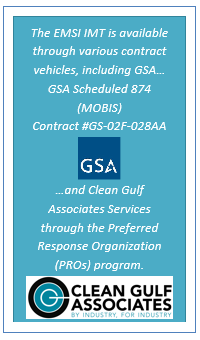 EMSI is a service-disabled veteran owned, minority business enterprise (MBE) that supports a broad range of clients. To learn more about EMSI and how we can help your organization’s response preparedness, please visit www.emsics.com. To request the EMSI IMT for your team, please contact us at 540-423-9004 or IMT@emsics.com.